1980's microwave cart score at GOODWILL and Newbie party started. At least that is what I think this is, or was. I found it during my last trip to Goodwill. It was only $ 5.00. Now what I was going to do with it? That is usually the way my projects start out. CLUELESS! This year Jack wanted a small laptop for his birthday instead of a party. Seeing we are all on the computer at one time or another, I thought it was a good idea. Saves me from the heartache of brothers fighting over computer time. Now I needed a safe keeping for it. I cleaned it up real good with my disinfectant and krud cutter. Now that I am on the very last drop of my chalk paint, duck egg blue. I thought this is a great color for Jack's room. This was the first time I have used the dark wax. NOT a fan of it at all. To me it makes it look dirty. But this was perfect for Jack's room, because it usually is a dirty mess. I love this mini globe I scored for him at our Local humane society thrift store. I try to instill in Jack the importance of education, reading writing, etc. He is my tough one when it comes to academics. 25,000 off of one fish"
And there is the tale of my 1980's microwave cart. It holds Jack's college certificate, laptop and some special trinkets that were my Gramps! BLOGGING 6 months or less and/or less than 100 followers. Please add my link or button. If you are NOT a friend of mine, would Love to have you. I will not be leaving comments on Word Verification blogs anymore, it takes too much time and trouble. So IF you have Word Verification, please turn off. If you see your link is gone, it is because you did not follow my few simple guidelines. This party has been a great success in terms of growing your blog, and making new friends. DIY hand painted napkins tutorial! Happy Sunday Morning to you! A lot of you gals are anxious to see how I did these pretty hand painted napkins! I have said it before, I am NO PICASSO! Stencils are so easy to work with and come in such great patterns anyone can achieve a hand painted custom look when using them. I will show you the step by step. Pardon some of the pics, blurry, as I did this early this morning. These dishes were my inspiration. I just happened to have the same stencil pattern on hand that I picked up at hobby lobby. Start with a plain white napkin, and fold it over on each side length wise. I did actually press the ones I did already, but this is just a quickie to show you. Take your stencil and place it over the napkin. Don't worry if it does not cover the entire napkin. I then taped it down on each side. I love my little stencil roller..I also picked one up from Hobby lobby. And that is that. I did add a personalized letter Monogram on mine. Can't wait to share with you my table setting soon. Annie Sloan Chalk paint, FINAL day! It has been a blast to help the girls out at Robyn Story Designs get the word out on the Mountain of Giveaways! 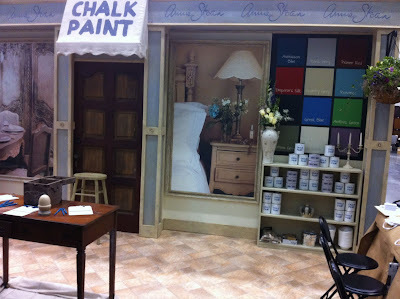 Do you know they have 10 cans of Annie Sloan chalk paint and MORE that they are giving away? TODAY is the final day to enter, so hop on over and get in on it. YOU never know you could be the lucky winner. Click on the button and head on over. Have a great weekend! See you tomorrow night for the NEWBIE party. 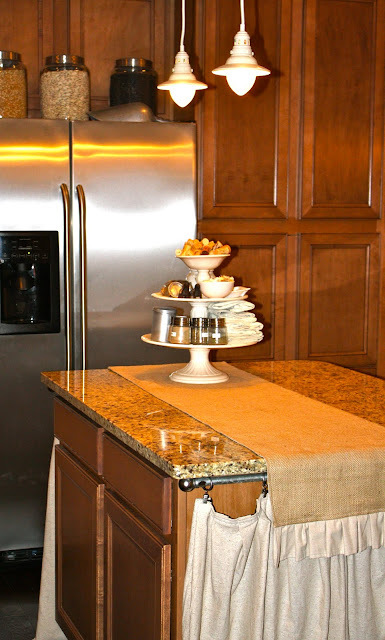 Hand painted napkins are so pretty, and so easy to make your self. I have a stack of white linen napkins, that were given to me. I thought at the time not sure what I will do with them, but sure I will take them. and Mike's Birthday's. Alex is having the 70's party, and I plan on making Mike a nice dinner. It is so nice when something pops in your head, and you have everything you need on hand. These were very quick and easy to do, and I will show you soon. Basically, stencil, paint of your color choice, plain white napkins, and a small stencil roller. Can you see what I plan on doing soon? Can't wait to share with you these gorgeous new dishes. BTW, I went back and got just one MORE featherhead.... A Blazin hot RED one! Did you know these things are in HOT demand right now? Fisherman apparently are very angry with the hair industry. OH well, you can take me fishin and dunk my head a few times. JULY 30th will be the final day to get in on the MOUTAIN of GIVEAWAYS! 10 CANS of Annie Sloan chalk paint and more! What is a featherhead you ask? I had no clue until yesterday when I went in for a haircut, and my cute hairdresser, 20 years my junior mind you, had them in her hair. I loved them, and tend to think I am cool and trendy sometimes, (cough, barf, gag)and felt I had to have a few myself. Much to Jack's horror, as he was with me. I think the boy was terrified to see what his Mom was going to look like. Which, hey, may work for some, but a little much for an old Mom. So I decided to get only a few. They last for several months, and you can treat them like your own hair, curl them, straighten, wash, hairspray, they tolerate everything but hair color. I went a little conservative because I was not sure what my hubs would think. When I mentioned getting one more, he said WHY not? Go for it, it's fun! Poor guy, he has been through so many hair colors, cuts, and changes with me....he just knows nothing to do with my hair is permanent...OH and I had perms too! So have you seen anyone with them yet? Top three links at the newbie party, and a RANT! hope this day finds you all well, and COOL! Well, COOL I am not. Crazy hot here in the South this summer. Wanted to share my top three most clicked on links at the newbie party this week. I have a few concerns first I would LIKE to mention, and this is mostly for the newbies. FIRST off do realize I do this party, for you. I started it because, I know how it is to be a new blogger, and I know how you feel to be a fish out of water. My gratification is that, I get to see your blogs grow, and I too make new friends along the way. I pay to have Mr. Linky, and I take my time to visit every link, and comment on the most that I can. SEEMS, my guidelines are not being met by many who link up. I should NOT have to remind anyone at this point to add my link or button, yet week after week, I DO. I have decided I am just going to delete the entry, I am sorry to say. Many hosts have asked time and time again to please turn it off. way too time consuming, and really an unnecessary feature on the comment section. OK, enough of my soap box, let's get these features underway.....Hope you understand my rant, but I felt validation to address it. I Have tutorials and blogging tips HERE, if you are new to blogging, they certainly will benefit you to read them. She has some great tutorial as well..so go check it out. Jan took us on a little tour in to Bon, Secour, Alabama. 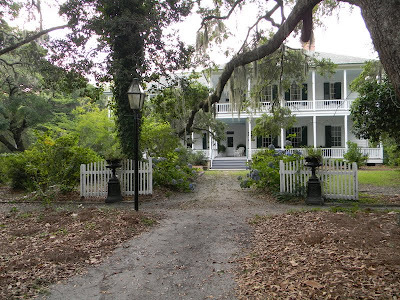 Lots of history there, not to mention these awesome homes. so hop on over girls, and welcome these newbies if you have not already. Thank you...have a great day! I have a lot going on this month with the boys, and we are getting ready for back to school. It has been a wonderful summer, however, I look so very forward to FALL..my favorite time of year. If I blabbed about you, please feel free to grab my button. OOps...sorry not going to happen! Sorry about that, I published a post I should not have been so quick to do so.......I just removed it until further notice. I with much regret wish to tell you, the magazine copy cat challenge will be on hold. NOT sure what the heck I was thinking...first off it is my son's birthday that day, and the next day he wants to have a 70's birthday party at home the next day. I will inform you of the next day I can come up. August is kinda crazy around here, school will be starting as well. I saw Cindy was having a painted furniture party and I thought I would put a quick post together of some projects I have done this past year. I have a lot of new readers that may never have seen them, so why not show you in one post. First off, let me tell you, I was, and hopefully still known as the "spray paint queen". Love me some spray paint. However, since Annie Sloan chalk paint has been exposed, I have put down the can for now and moved on to bigger better things. No offense Krylon, but you have nothing on Annie. This is an end table in our master bedroom...was a very dark espresso color originally. The blue did not stop there, it went on and on..
Then I was given a can of cream for hosting a giveaway..and decided I would totally transform our bedroom furniture, it was a risk and a lot of work, but the end result was so worth it. And I started to do little projects..
lots of little things have received a new fresh coat of paint. These bar stools were fun, and the best part is COUNTRY WOMAN MAGAZINE loved them too. and for the record I am not getting paid to promote Annie Sloan paint, I am just giving a personal opinion on how much I have enjoyed working with it. 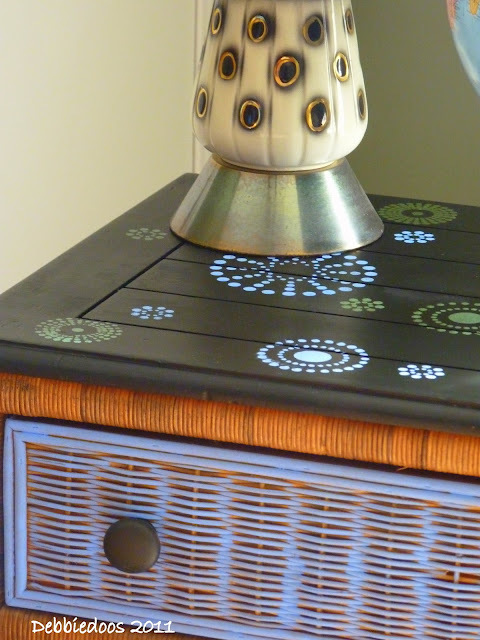 It sure has been fun sharing some painted furniture projects with you. and Kim for her WOW us Wednesday party. Speaking of Annie Sloan chalk paint, do you know there is MOUNTAIN of GIVEAWAYS going on NOW?